First I must apologize for missing last week's post. I had some real life drama (not personal, but bad stuff for a good friend) that got in my way and then I go horribly sick. "I must own that on my entrance into this massy building, an uncommon vacancy, which seemed to reign in it, rather damped than raised an impression of anything majestic in me. All around me I could see nothing but immense bare walls and pillars. Above me, at an astonishing height, was the vaulted stone roof; and beneath me a plain, flat even floor, paved with marble. No altar was to be seen, or any other sign that this was a place where mankind assembled to adore the Almighty. For the church itself, or properly that part of it where they perform divine service, seems as it were a piece stuck on or added to the main edifice, and is separated from the large round empty space by an iron gate, or door. Did the great architects who adopted this style of building mean by this to say that such a temple is most proper for the adoration of the Almighty? If this was their aim, I can only say I admire the great temple of nature, the azure vaulted sky, and the green carpet with which the earth is spread. This is truly a large temple; but then there is in it no void, no spot unappropriated, or unfulfilled, but everywhere proofs in abundance of the presence of the Almighty. If, however, mankind, in their honest ambition to worship the great God of nature, in a style not wholly unsuitable to the great object of their reverence, and in their humble efforts at magnificence, aim in some degree to rival the magnificence of nature, particular pains should be taken to hit on something that might atone for the unavoidable loss of the animation and ampleness of nature; something in short that should clearly indicate the true and appropriated design and purpose of such a building. If, on the other hand, I could be contented to consider St. Paul’s merely as a work of art, built as if merely to show the amazing extent of human powers, I should certainly gaze at it with admiration and astonishment, but then I wish rather to contemplate it with awe and veneration. But, I perceive, I am wandering out of my way. St. Paul’s is here, as it is, a noble pile, and not unworthy of this great nation. And even if I were sure that I could, you would hardly thank me for showing you how it might have been still more worthy of this intelligent people. I make a conscience however of telling you always, with fidelity, what impression everything I see or hear makes on me at the time. For a small sum of money I was conducted all over the church by a man whose office it seemed to be, and he repeated to me, I dare say, exactly his lesson, which no doubt he has perfectly got by rote: of how many feet long and broad it was; how many years it was in building, and in what year built. Much of this rigmarole story, which, like a parrot, he repeated mechanically, I could willingly have dispensed with. In the part that was separated from the rest by the iron gate above mentioned, was what I call the church itself; furnished with benches, pews, pulpit, and an altar; and on each side seats for the choristers, as there are in our cathedrals. This church seemed to have been built purposely in such a way, that the bishop, or dean, or dignitary, who should preach there, might not be obliged to strain his voice too much. I was now conducted to that part which is called the whispering gallery, which is a circumference of prodigious extent, just below the cupola. Here I was directed to place myself in a part of it directly opposite to my conductor, on the other side of the gallery, so that we had the whole breadth of the church between us, and here as I stood, he, knowing his cue no doubt, flung to the door with all his force, which gave a sound that I could compare to nothing less than a peal of thunder. I was next desired to apply my ear to the wall, which, when I did, I heard the words of my conductor: “Can you hear me?” which he softly whispered quite on the other side, as plain and as loud as one commonly speaks to a deaf person. This scheme to condense and invigorate sound at so great a distance is really wonderful. I once noticed some sound of the same sort in the senatorial cellar at Bremen; but neither that, nor I believe any other in the world, can pretend to come in competition with this. I now ascended several steps to the great gallery, which runs on the outside of the great dome, and here I remained nearly two hours, as I could hardly, in less time, satisfy myself with the prospect of the various interesting objects that lay all round me, and which can no where be better seen, than from hence. Below me lay steeples, houses, and palaces in countless numbers; the squares with their grass plots in their middle that lay agreeably dispersed and intermixed, with all the huge clusters of buildings, forming meanwhile a pleasing contrast, and a relief to the jaded eye. At one end rose the Tower - itself a city - with a wood of masts behind it; and at the other Westminster Abbey with its steeples. There I beheld, clad in smiles, those beautiful green hills that skirt the environs of Paddington and Islington; here, on the opposite bank of the Thames, lay Southwark; the city itself it seems to be impossible for any eye to take in entirely, for with all my pains I found it impossible to ascertain either where it ended, or where the circumjacent villages began; far as the eye could reach, it seemed to be all one continued chain of buildings. I well remember how large I thought Berlin when first I saw it from the steeple of St. Mary, and from the Temple Yard Hills, but how did it now sink and fall in my imagination, when I compared it with London! It is, however, idle and vain to attempt giving you in words, any description, however faint and imperfect, of such a prospect as I have just been viewing. 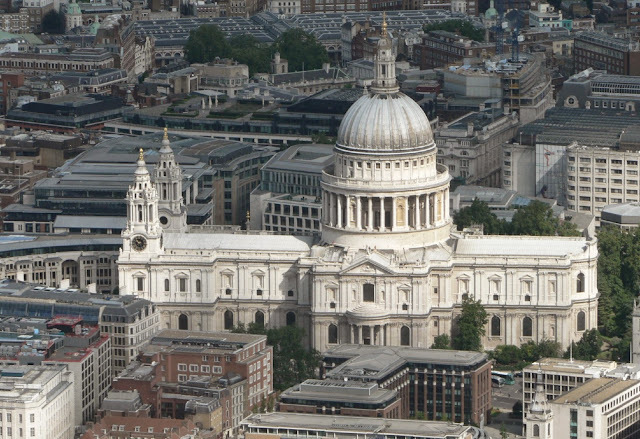 He who wishes at one view to see a world in miniature, must come to the dome of St Paul’s." 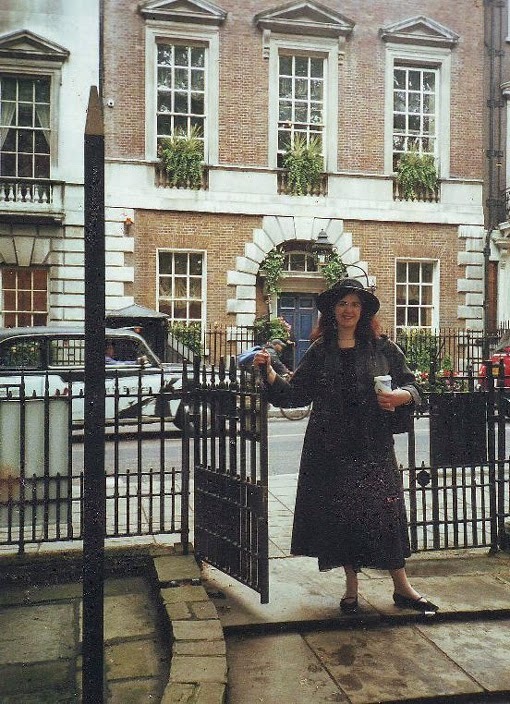 I was an early adapter (as they say in the tech world) of WOLF HALL, In fact, back in 2010, Hilary Mantel's publicist sent me a letter asking if I would review the novel for my blog. I rarely posted to my blog at the time, being a busy author myself, and I told Ms. Mantel's publicist that as a fellow author I felt uncomfortable about giving a review of a colleague's work. However, because I had indeed written about Henry VIII and his many love affairs and marriages in my nonfiction books ROYAL AFFAIRS and NOTORIOUS ROYAL MARRIAGES (which is why they wanted me to review WOLF HALL in the first place, I told the publicist that I would be delighted to read the novel and if I loved it, I would be certain to write about why I loved it, and let all my readers and colleagues know that. P.S. : I loved it and did end up writing a blog post that was more or less in the form of a rave review. I adore voice-y fiction and Mantel has one helluvan author's voice. Many like it; many don't, but I'm one who does. I'm not personally fond of Thomas Cromwell the man, but as someone who writes about history's "bad girls" -- women who have gotten a bad reputation most often from centuries of propaganda delivered to us as truth instead, I'm fascinated by the choice of Cromwell as protagonist and grateful to see the Tudors through eyes other than one of Anne Boleyn's handmaidens for a change. The prose is meaty and muscular, gristly at times, but delicious. And I enjoyed Ms. Mantel's second novel in the trilogy, BRING UP THE BODIES as well. By then I found it a quicker read than WOLF HALL and the minor quibble I'd had about the first novel (the same minor quibble shared by hundreds of others, evidently -- namely that of applying the pronoun "him" every time she referred to Thomas Cromwell when there were so many other males in the room often created confusion) had been pretty much resolved. So, what would happen, I wondered, when Ms. Mantel's novels, which for the most part are faithful to the historical record -- except for my other minor quibble -- when she does not need to stray into Philippa Gregory territory to make things up (like attributing Henry's sons to Mary Boleyn, which (a) is not true and (b) he got a perfectly good one off another royal mistress Bessie Blount) were translated to the stage--and then be transformed into a BBC miniseries? Would the author's voice get lost as is so often the case with that other oft-adapted author Jane Austen? I am SO glad to have seen the Broadway plays before I saw the first part of the bloated and miscast miniseries. Oh, did I tip my hand too much just now? For the Broadway/Royal Shakespeare Company production (presented in 2 parts as 2 separate plays: Part 1 is WOLF HALL and Part 2 is BRING UP THE BODIES -- both titled for ease of comprehension as WOLF HALL) is everything the miniseries should be. It is brilliantly cast. The pacing is swift and sure. Each play is nearly 3 hours with an intermission. And the first play, in particular speeds by. There are pacing issues with the lumbering first act of the second play. Too much exposition. Replacing the author's voice on the page (in the stage play) are humor and wit. Just enough. In the right places. The plays are by no means comedies. But life is a human comedy. And we are witnessing whip-smart people. Many of the same lines in the mouths of the miscast actors in the miniseries fall flat. I found the teleplay to be utterly humorless. The first episode flatlined for me. While I sat in my seat at the Winter Garden Theatre on Broadway and couldn't wait for more, and leapt to my feet for each curtain call in what is truly an ensemble cast, I nearly fell asleep during the droning delivery of the actors on television. How could the same material be presented in two such different iterations -- one so lively and one so dull? The stage set for the theatrical event is big and gray. The miniseries takes you into a zillion Tudor-esque locations, so faithful to what we imagine the originals must have been -- and yet that version is the least interesting! On Broadway, even though the actor playing Henry (Nathaniel Parker) has a dark beard, he is a tall man (and his costume is increasingly padded as time goes on). When he thunders, you quake in your boots. When he smiles you melt. When he dances (as in the opening of the play), you want to take your clothes off and throw yourself at him. THAT is Henry VIII in his prime. Not the small voiced, mewling guy, redbearded though he is, in the miniseries. A small performance that wouldn't frighten (nor seduce) anyone, nor is he, like the Broadway Henry -- a worthy adversary for Cromwell, who on Broadway has every other line, and is probably way too charismatic -- but that's Ms. Mantell's Cromwell, and she co-wrote the plays, so it's her prerogative. Perhaps therein lies the vast discrepancy between the stage and screen versions. Ms. Mantel ultimately had a vast deal of input into the scripts for the stage. Whoever wrote the teleplays was trying so hard to be earnest and faithful to the novels that the production became a crashing bore. And the novels -- and the stage adaptations -- are anything but boring. As I saw the Broadway plays in previews. Ms. Mantel herself was there. 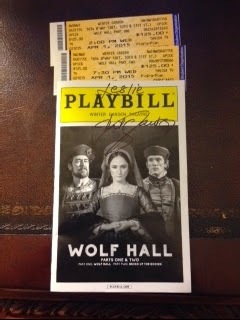 She signed my Playbill. 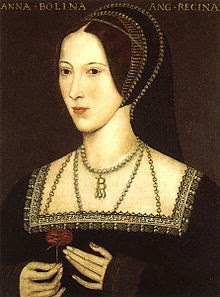 I congratulated her on another great success but afterwards I wished I could have given her a note: I would have liked to have seen more of Anne Boleyn's vulnerability. I felt she was a little too one-note shrewish throughout the 2 plays. I wanted to see more of what made Henry fall in love with her and be willing to wait 7 precious years for her. Have you read WOLF HALL and/or BRING UP THE BODIES? What was your impression? Have you seen either the Broadway/RSC productions or the miniseries? Care to compare and contrast your opinon of them to the novels? Getting ready for the May 15 release of my next Malcolm and Suzanne Rannoch mystery, The Mayfair Affair, I've been revisiting some Mayfair locations that feature in the book. Here's a brief photo tour from some wonderful trips I took over a decade ago. 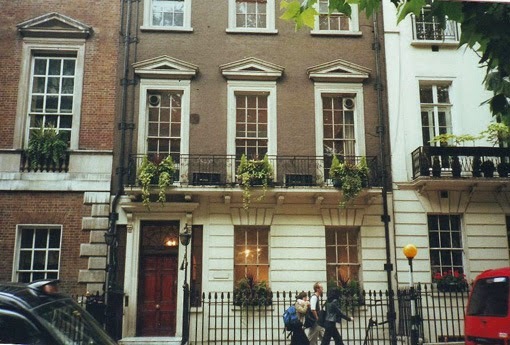 Here I am in Berkeley Square, the beautiful square in the heart of Mayfair, where Malcolm and Suzanne live. 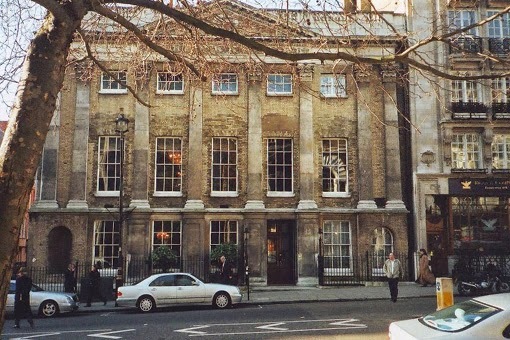 This is Brooks's the famous club in St. James's Street that the Whigs frequented. 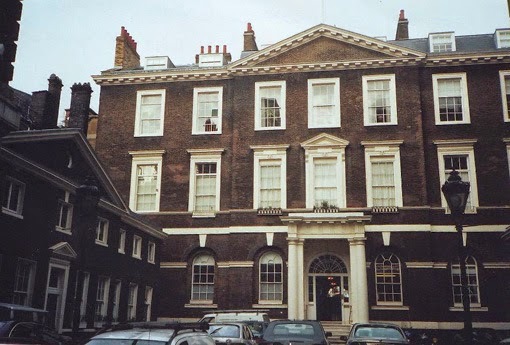 The Mayfair Affair opens with the fictional Duke of Trenchard found murdered in his house in St. James's Square, not far away. Do you like to visit locations in favorite books? Writers, what are your favorite research trips?